As dramatic as these developments might seem, Canadians were long primed for the media narrative of an all-season transport artery to the Arctic Ocean. That’s because the highway follows the same route as the ice roads featured in Ice Road Truckers, the popular reality television show that airs on the History Channel. For well over a decade, Ice Road Truckers and its Discovery Channel reality counterpart Deadliest Catch have represented compelling (and historically successful) productions from the Arctic reality entertainment genre—featuring impossible jobs in remote (and otherwise unknown) geographies. The former highlights long-haul truckers who traverse frozen lakes in the north to deliver cargo and infrastructure to isolated northerly worksites. Deadliest Catch, meanwhile, provides viewers with a first-hand perspective of Alaska crab fishing on the Bering Sea. Emphasizing themes of adventure, conflict, and resources extraction, both programs romanticize and commodify the polar region, transmitting powerful images and frontier narratives into households across North America and internationally. Their early success was responsible for the overnight growth of a much larger Arctic reality genre featuring survivalists and ice pilots and independent gold prospectors. Some of these productions have come and gone; while others hobble on. Most, however, have been dismissed by critics. In a symbolic blow last February, Emily Fehrenbacher, the Anchorage Daily News columnist dedicated to Alaska reality TV, announced that even she was ending her column. The genre had apparently run its course—a point that not many argued with. But whether they are continued or not, the longevity of Ice Road Truckers and Deadliest Catch points to a loyal fanbase across North America (and internationally) and an enduring interest in the Arctic as a mediated frontier geography. Perhaps ironically, these reality programs have created their own their kind of reality—one that has real implications for public perceptions and even policy for the region. To draw from the media theorist Marshall McLuhan, it is worth understanding not only what is communicated within these programs, but also the contexts—history, geography, economy, technology—in which they are produced, transmitted, and received. Not that either program should be expected to be around for much longer—mostly due to the economics of the television industry but also, yes, a genre that has seemingly run its course. Another key determining variable is climate change—a recent twist that has been incorporated into the storylines of both shows. 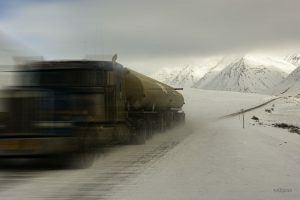 Changing weather conditions in the north have hampered the ability of truckers to traverse increasingly risky ice roads. In the case of Deadliest Catch, once-reliable fishing grounds have been rendered unproductive. In this sense, both Ice Road Truckers and Deadliest Catch have provided an important, if counter-intuitive, entry point for larger discussions about the Arctic’s ecological future. At the same time, these shows have secured their place in the mythology of the North American Arctic by helping to create it. Derek Moscato is an assistant professor in the department of journalism at Western Washington University in Bellingham, Washington. His research interests include environmental media, global strategic communication, and public diplomacy. His research article “The Political Economy of Arctic Reality Television: The Spatial Communication of Ice Road Truckers & Deadliest Catch” was published in the 2017 Arctic Yearbook.